The final of our Valentine’s Tweet Heart competition took place on 11th February as part of a live broadcast with Beat. The winners were Lisa Grace & David Ryan who as it turns out were playing on behalf of Ethan & Claire as the latter could not get off work to make the final. 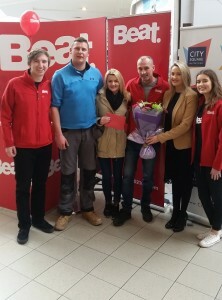 The prize was a €1000 worth of vouchers for stores in City Square Shopping Centre here in Waterford.